The Minardi family runs the oldest Fiat dealership in Italy which dates back to 1927. In the late 1940s Giovanni Minardi built his own single-seater racing cars and Giancarlo was a regular race-goer from when he was a toddler. Unfortunately Giovanni Minardi died young leaving the family businesses to be run by his widow Elena. These were gradually taken over when her three sons were old enough: Giuseppe taking over the Fiat dealership, Nando running the truck concession and Giancarlo running the family racing team. In 1980 Giancarlo set up the Minardi team with backing from Piero Mancini - a well-known patron of Italian motor racing - and former Ferrari engineer Giacomo Caliri was hired to design an F2 chassis at his FLY Studio in Bologna. Two Minardi-BMW FLY280s were built and raced in the European Formula 2 Championship in 1980: one by Miguel-Angel Guerra, the other shared between Bruno Corradi, Beppe Gabbiani and Johnny Cecotto. They were not successful. In 1981 Caliri built the FLY281 and Minardi signed Michele Alboreto to partner Cecotto. Alboreto took pole at Pau and won at Misano. Although Alboreto moved on to F1, Minardi hired two new youngsters in 1982 Alessandro Nannini and Paolo Barilla. Caliri updated the BMW-engined FLY281 to B specification and Nannini was impressive, finishing fifth on his F2 debut at Silverstone and ending the year with a second place at Misano. The FLY283 was the first composite chassis - which Minardi intended to use as the basis of an F1 car in 1984. Nannini continued to race in F2 alongside a number of others but there were no major results. The F1 program was suspended when the team failed to find a turbocharged engine but in the summer the team unveiled its 184, fitted with an Alfa Romeo F1 engine. This was tested but as Alfa would not supply the team, Mancini convinced Carlo Chiti to leave the company and funded the Motori Moderni engine company. The team first appeared with Ford Cosworth engines at the start of 1985 but as Nannini was refused a superlicence Pierluigi Martini drove the car. It was not a success. The Motori Moderni engines were underpowered and unreliable. At the end of the year Martini went back to F3000 to rebuild his career. Nannini stepped in and was joined by Andrea de Cesaris in the two-car team backed by Simod. The first new car did not arrive until September. De Cesaris left at the end of the year and was replaced by Adrian Campos but reliability remained disastrous and Nannini was soon lured away to Benetton. For the 1988 season Minardi switched to Cosworth DFZ engines and Campos was joined by fellow Spaniard Luis Sala. The M188 was a better car and the team scored its first point in Detroit in June - Martini having taken over from Campos for that race. In an effort to improve the team hired Aldo Costa to be its technical director and lured English aerodynamicist Nigel Cowperthwaite to Italy. The team took a big step forward in 1989 by becoming the top Pirelli tyre team. Martini and Sala stayed on and at Silverstone the pair finished fifth and sixth. Pirelli qualifying tires allowed Martini to qualify on the second row at Jerez and in Australia. The following year Martini put his M189 on the front row of the grid at Phoenix but money was still short and the team had to run pasta heir Paolo Barilla. Cowperthwaite departed and was replaced by French aerodynamicist Rene Hilhorst. Giancarlo Minardi pulled off a major coup when he convinced Ferrari to supply the team with customer engines in 1991 but at the last minute Ferrari snatched Minardi's Pioneer sponsorship and left the team short of money. Richard Divila was hired to work with Martini and Pierluigi scored two fourth places while Gianni Morbidelli also did well. At the end of the year Martini decided to move on to rival team Scuderia Italia. Unable to afford Ferrari engines again, Minardi switched to Lamborghini V12s and Morbidelli was joined by Christian Fittipaldi. Money was still short and in France Fittipaldi crashed heavily and injured his neck. He was replaced by Alessandro Zanardi, but returned and ended the year scoring Minardi's only point of the season in Japan. The team hired Gustav Brunner to design the 1993 chassis. This was fitted with Ford engines and driven by Fittipaldi and Fabrizio Barbazza. At the end of the year - struggling to survive - Minardi agreed to merge with Scuderia Italia. Brunner moved to Ferrari but the team had a good driver line-up with Alboreto and Martini. Some sensible results enabled Minardi to conclude a deal to use Mugen Honda engines in 1995 but this contract was broken by Mugen when an opportunity arose for the company to supply the Ligier team. The team was forced to abandon its legal action against Briatore when all its equipment was seized at the French GP because the team had failed to pay Briatore for its Ford engine supply in 1993. The 1995 season was badly disrupted and it was only in Australia that Pedro Lamy was able to pick up a point. The team signed up Giancarlo Fisichella to partner Lamy in 1996 but money ran short again and at the end of the year Minardi was forced to sell the majority of the team to a new consortium, which bought 70%. Minardi retained 14.5% and the Scuderia Italia investors (Emilio Gnutti, Giuseppe Lucchini and Vittorio Palazzani) held on to 14.5% while a fourth Defendente Marniga retained one percent. The new consortium was controlled by Briatore but included Fondmetal's Gabriele Rumi and former driver Sandro Nannini. Fisichella was sold to Jordan, Jarno Trulli signed for the 1997 season and Ukyo Katayama was hired to bring in some more money and a deal struck to use Hart V8 engines. The uneasy alliance between Briatore and Minardi did not last long. He tried to sell the team to British American Tobacco but was blocked by Minardi and Rumi and at the end of 1997 he sold his shares to Rumi. He invested heavily in hiring new staff and convinced Gustav Brunner to return as technical director. He also rehired Cowperthwaite and contracted Cesare Fiorio to be the team's sporting director. 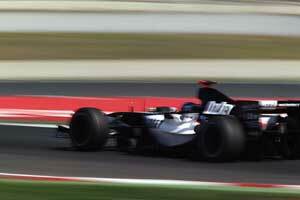 Sponsorship was found from drivers Shinji Nakano and Esteban Tuero but results were disappointing. For 1999 the team did a deal to use old Ford V10 engines and hired Marc Gene (with backing from Telefonica) and Luca Badoer. The Spaniard did surprisingly well and scored a point at the Nurburgring. By then, however, Rumi was trying to sell the team. This was not successful and the team remained unchanged in 2000 with Rumi buying the rights to the Ford V10 engine and announcing that he would develop the engine as a Fondmetal V10. In the middle of 2000 he announced that he had sold the team to South American TV company PSN but the deal was never completed and in January 2001 Rumi sold the team to Australian businessman Paul Stoddart. Under Stoddart Minardi expanded and took on new staff and hired Mark Webber to drive. He scored a popular fifth place in Melbourne but the financial crisis of 2002 created pressure on the team and Stoddart was pushed to hiring pay-drivers in 2003 and 2004. Despite this, and the death of sporting director John Walton in 2004, the team held together and Stoddart went into 2005 hoping for better things with Christijan Albers and Patrick Friesacher. By the midseason it became clear that there would be an 11th team in F1 if Stoddart did not sell the team and rather than facing the loss of TV money and the inevitable closure of the team, Stoddart sold the operation to Red Bull and it was renamed Scuderia Toro Rosso. The Minardi name remained in racing with Giancarlo Minardi running a team in the International 3000 Championship in 2006 and then moving into GP2 in 2007, while Stoddart bought the HVM-CTE Champ Car team and used the name Minardi Team USA.